When you have aspirations of creating a new interior design, your flooring is a great place to start. The effects that choosing a new floor can have your interior space can’t be understated. When homeowners wish to browse high-quality tile flooring selections, they know to turn to My Flooring America of Sugar Land. At our vast showroom, we proudly showcase an impressive arrangement of premium floor choices including rectified tile in Sugar Land, TX. If you're looking to augment your space with smooth, polished look, let our knowledgeable flooring specialists show you why rectified floor tiles are a perfect choice. Also known as “dimensionally stable” or “sharp edge” tiles, rectified tiles have been mechanically sawn or ground down on all sides to achieve a precise, uniform look. During this process, manufacturers shape a rectified ceramic tile precisely using specialty equipment to ensure they are perfectly angled and flat. Even with modern manufacturing processes, no two ceramic or porcelain tiles are identical. Due to being baked in a kiln, they experience slight shrinking and warping. Though this generally goes unnoticed, these mild variations can ultimately make a difference in the quality of the finished job, especially with large installations. Due to the precise dimensions of a rectified porcelain tile, it may be laid closer together than a traditional tile, allowing fine, narrow grout lines of 3mm or less. 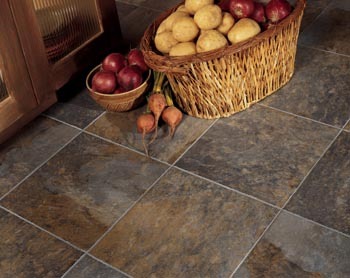 They are less likely to show imperfections such as lapping or uneven spots, due to wider grout lines. The result is a clean, symmetrical installation that offers a seamless look any homeowner would be proud to have. Ensuring you receive a beautiful, precise-cut flooring solution starts with installation from our trained crew members. We know how much your home investment means to you. That’s why our rectified tile installation crew treats each product we work with as if it were our own flooring choice. We make it our mission to leave our customers with clean, expertly fitted tiles that offer a highly desirable look they are sure to enjoy. With our skilled professionals laying your flooring in place, you’ll be able to enjoy your expertly crafted floors as soon as possible. Put your needs in the hands of our dedicated flooring installation team and you are sure to receive the outstanding results you deserve. Contact our flooring store to learn more about our premium rectified flooring selections. We proudly serve homeowners in Sugar Land, Missouri City, Stafford, Fort Bend, and Sienna Plantation, Texas.